Omega-3 and Omega-6 have taken most of the spotlight when it comes to fatty acids. It’s commonly known that fish, healthy oils and nuts are a great source of these essential nutrients. That’s great, but what about the other fatty acids? What about Omega-7? You might be wondering what it is and why you haven’t heard much about it. Good timing, read on to find out more about the great health benefits of Omega-7. Enough mystery, this is what Omega-7 is, in short. Omega-7 is a fatty acid also known as Palmitoleic acid. In general, fatty acids support the body in many, many different ways. They help our bodies to grow and function at optimum level. They help to keep cholesterol levels down, reduce inflammation and keep blood sugar levels stable. Unlike other popular fatty acids, our bodies actually do produce Omega-7, but because it’s so beneficial, it’s well worth getting an extra dose. But the interesting thing about Omega-7 is what it can do to our stored fat. Studies have shown that it can actually help to target and burn stored fat. I won’t go deeper into that now as we’ll go through the benefits soon. In short: Omega-7 is a fatty acid produced in the body but can be sourced through certain foods. It helps the body to burn stored fat, among other benefits we will explore further down. Weight loss, particularly fat loss is a popular reason why people seek Omega-7 sources and supplements, once they know about the benefits. This clever fatty acid can help the body to access and burn stored fat for energy, helping the body fat percentage, and overall weight to decrease. What’s more, Omega-7 can also help to keep us feeling full and satiated, reducing unnecessary snacking and overeating. Omega-7 isn’t a magic diet pill which will do all the weight loss work for you, but it can really help you to see much faster, more satisfying results from your nutrition and exercise plan. Good cholesterol (HDL) must be supported, and bad cholesterol (LDL) must be kept at bay for a healthy cholesterol balance. Omega-7 helps to keep these two opposing cholesterols in check. Healthy cholesterol levels are crucial for a healthy heart with low risk of heart disease. Therefore, Omega-7 is great for the heart! Keeping our heart healthy from a young age through proper diet, nutrient-dense food and exercise are one of the best things we can do for our body and future. Omega-7 helps to promote insulin sensitivity and regulates blood sugar levels. Both of these are essential for reducing the risk of diabetes. The combination of reduced fat, a healthy weight, stable cholesterol levels and stable blood sugar all contribute to the avoidance of diabetes. Inflammation in the body can cause all kinds of problems. The health issues we all fear such as heart attacks and strokes can be encouraged by high levels of inflammation. What’s more, cognitive conditions such as dementia can be increased by inflammation. Omega-7, like all of the “star” Omegas, is a fantastic tool to fight against inflammation and its associated complications. Like most fatty acids, Omega-7 helps to keep the skin healthy and glowing. It supports skin cells and helps them to repair and re-grow. A lovely benefit of Omega-7 is reduced wrinkles and fine lines, as well as a plumper, more healthy-looking skin. That’s always a welcome effect of any supplement or food source! Sea Buckthorn: this is the most “hyped” Omega-7 food source as it is the most potent, and also the most unusual. Sea Buckthorn is a land-based tree, and not a marine plant, as you might think at first. The berries and seeds are very high in Omega-7, so they are squeezed of their oils and juices. You can take Sea Buckthorn orally with oil-based capsules. Eggs: the reliable egg comes in handy once again. Egg yolks are a great source of Omega-7. A boiled egg as a snack is a great way to up your Omega-7 intake as well as having a protein-rich treat to keep you going. Avocado: avocado-lovers will be thrilled to learn of another benefit of their beloved green fruit. Avocados are full of great fats and oils to keep our skin, hearts and brains healthy. Put avocado in your salad, on your toast or even in your smoothie for extra Omega-7. Nuts: most nuts are a great source of fatty acids, but macadamia nuts are especially high in Omega-7 fatty acids. The unfortunate thing is that in many places, macadamia nuts are really expensive. If you’re lucky enough to live somewhere where macadamia nuts are affordable, stock-up on them and have a few as a snack throughout the day. Olive oil: sometimes it seems olive oil has the answer to almost anything. As well as a whole range of other health benefits, olive oil is a reliable source of Omega-7. Cold-pressed olive oil is the best way to go, as the nutrients have not been corrupted by heat. For that reason, use olive oil on your salads or even drizzled into creamy smoothies (perhaps with your avocado!) to get the most of that Omega-7s. If you find it too hard to cater your diet toward a specific nutrient, supplements are a good alternative. There are many Omega 7 supplements that are being sold in the market. Make sure you do your due diligence in researching the product before making a purchase. When purchasing oil supplements, it would be good if the oil was extracted using the cold press technique as this retains the beneficial natural properties of the product. 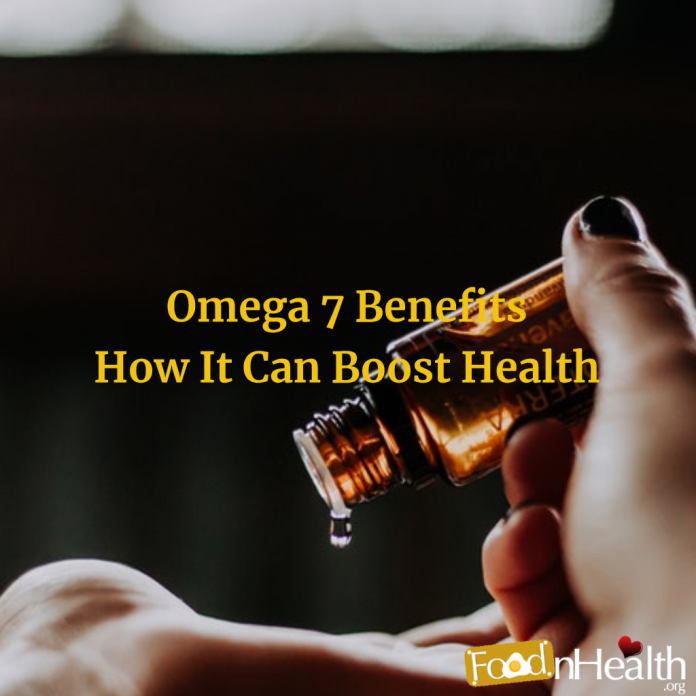 Increasing your intake of foods and supplements rich in Omega-7 could really help you to avoid diseases and health complications in the future. A healthy heart, reduced stored fat, glowing skin and an overall healthy, well-supported body can be brought a step further to you with Omega-7. Add olive oil, nuts, eggs and avocados to your daily diet and invest in a supplement for an extra Omega-7 kick.